The other day I brought home a new primer and my husband asked me, “What does primer even do?” So I threw a swatch of it down on my hand, let it dry and then ran some eye shadow across a section with and a section without. I was actually pretty surprised by the difference it made! I knew it made a big difference, but seeing it side by side, I was impressed! See the difference? I mean really, the picture speaks for itself! Primer gives the shadow something to really stick to and helps it last. It allows you to really build up a bold, beautiful color that you just can’t get without primer. Honestly, if you aren’t using primer, you are probably using WAY more product than you would be if you had just primed your lids. 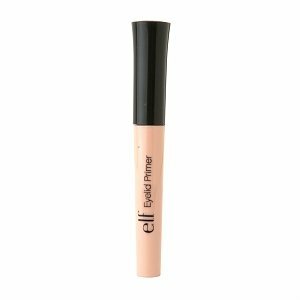 If you are looking for a great drugstore primer check out, e.l.f. Eyelid Primer . It’s only $3.95 from Amazon. If you want to spend a little more cash and get my favorite, check out Too Faced Shadow Insurance Primer. Don’t want to buy a primer at all? Try using concealer on your eyelids to give your shadow a little something extra to stick to. Are you using an eye primer you really love? Have you tried any great lip or face primers to make your makeup really last? This entry was posted in Beauty, Makeup on March 13, 2013 by Heather. Thanks for that! At 32 I’m only just now getting into make up & treated myself to a Bare Minerals kit which comes with primer. Yesterday I forgot to apply primer & within hours my make up had vanished lol. This really explains it all so thank you. I HATE when I am half way through my eye makeup and I realize I have forgotten to prime! Feels like I just wasted so much time! Maybe someday I will figure out how to remember it EVERY time! Glad this post was helpful, Thanks for reading! If you buy your primer from http://www.eyeslipsface.com you will save .95 each time. e.l.f. sells it for $3.00. Actually I can’t tell if you bought the $3.00 or $1.00 one. You may even save yourself $2.95 each time. Sometimes buying direct is the best way to go! I’m so glad to read of a good affordable primer! I love mine from MaryKay, but at $13 a tube I try to “save” it for days when I need to do my face. With the elf I could do my face every day! You can buy ELF eyelid primer for $1 at Target. Love that stuff! The colors appear to be darker on the left, but then again your hand is shadowed. Could you possibly take a picture that has the same amount of light for all three aspects, and then show us that?